For actor Gerard Canonico, hitting the sweet spot is all about artistic collaboration and a new, edgy musical is the best way to achieve that goal. It’s based on the 2004 novel of the same name by Ned Vizzini about a high school student who considers himself a loser, is tormented by bullies, invisible to girls. Then he learns about “squips”—a quantum computer in pill form that once ingested communicates with your brain. It could be his ticket to the high school hero highway. Being in new plays is what makes Gerard tick. 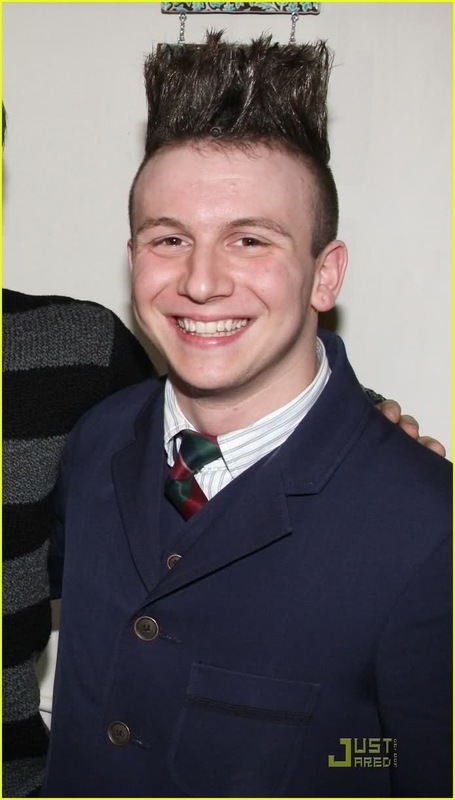 Gerard Canonico took over the role of Moritz in Broadway’s “Spring Awakening” from Aug. 4, 2008 until the show closed on Jan. 18, 2009. “I’ve been involved in a lot of things from the ground floor, including workshops and readings, but probably my favorite thing is being the first one to originate a role” said the 25-year-old actor who grew up in Matawan (NJ) and is a graduate of Middletown’s Mater Dei High School. It’s his first show at the theater, which is located about 10 miles from his hometown. “Nobody else has done it and you get to mold it. The process is extremely collaborative. You talk about line changes, what the character should be doing. “I’m a kinesthetic learner. I’ve got ADHD. I don’t just learn reading and listening. Even when we do a table reading, I have to be on my feet and move around a lot. Gerard said he has the same creative team experience working on “Brooklynite,” an off-Broadway musical about a group of superheroes that keep Brooklyn safe. it ran for two months earlier this year at the Vineyard Theatre in Manhattan. (He’s waiting to hear if the show has a future and includes him.) It’s got a book by Micheal Mayer and Peter Lerman with music and lyrics by Lerman. Mayer not only directed this musical but helmed the Broadway musicals “Spring Awakening” and “American Idiot,” both of which premiered with Gerard in the opening night cast. “Ever since ‘Spring Awakening’ I feel like I’m in a certain category: typically ‘rock musical.’ I live for it. I don’t know if I could be in a show with no emotional weight. I would get frustrated. I’ve had that conversation with my agent: ‘I don’t want to do revivals or tour.’ They’re wonderful, but they don’t bring me satisfaction. I know what I’m good at and what I do best. But that’s not how Gerard got his start on stage. His Broadway debut in 1999 was as the street urchin Gavroche in “Les Miserables.” He left it 18 months later to do “A Christmas Carol” at Madison Square Garden. He was in the national tour of “Casper the Musical,” starring Chita Rivera, and played Anna’s son Louis in the Paper Mill Playhouse 2002 production of “The King and I.” Off-Broadway work includes the pauper in “The Prince and the Pauper” (2002) and Brett in the musical “Children’s Letters to God” (2004), both at the Lamb’s Theatre. And like many male adolescent actors, he took a break from the stage for puberty. He also skipped college, which was hard as both of his parents are teachers, now retired, and musicians. But they are among his biggest supporters and recently attended an evening event “Making It On Broadway” at the Two River Theater featuring the young cast from “Be More Chill.” Gerard talked about his career and said it wouldn’t have happened without his parents who had to drive him from Matawan to NYC for every performance of “Les Miz,” just for starters. The entire cast advised about 40 teenagers and a few adults, not to go into show biz if they had the least bit of interest in anything else. It’s hard, really hard, they said. Once “Be More Chill” closes Jun 21, he doesn’t have another show lined up. Yet he considers himself lucky, one of the more successful actors in NY, he says. To make ends meet (he shares an apartment in Harlem), the self-taught drummer freelances with various artists playing all kinds of music. And he’s got what theater folk call a “survivor job,” teaching music at Apple Seeds, a play space for families with children newborn to age five, which has several locations in Manhattan. “It’s a nice survival job with a steady paycheck. I can work there in the morning. It gives me time to audition and do a shows in the afternoon or at night. You can only file for unemployment so many times,” he joked, kind of. As you can tell by reading Broadway actors’ bios in Playbill, they supplement their incomes working on TV shows filmed in the area, including “The Good Wife,” Blue Bloods,” “Elementary,” “Boardwalk Empire,” “The Following,” “Orange is the New Black”). But Gerard said those jobs are hard to get and that type “is a huge factor” for TV and film. “If you don’t look exactly like the character is suppose to — even if you kill at the audition — you won’t get it. He’s also waiting for the release of the independent film“Stuck,” in which he plays one of six strangers trapped on a stalled subway train. Amy Madigan (“Field of Dreams”), singer Ashanti and Giancarlo Esposito (TV’s “Revolution’) also are in the cast. It’s adapted from the stage play by Riley Thomas, who co-scripted with director Michael Berry. “Right now, auditioning is my job,” Gerard adds.